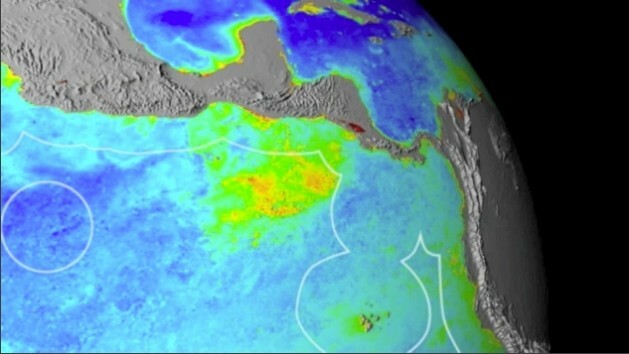 SAN JOSE, Oct 20 2014 (IPS) - The vast habitat known as the Costa Rican Thermal Convection Dome in the eastern Pacific Ocean will finally become a protected zone, over 50 years after it was first identified as one of the planet’s most biodiversity-rich marine areas. At the 12th meeting of the Conference of the Parties to the Convention on Biological Diversity (COP12), held Oct. 6–17 in Pyeongchang, South Korea, the Dome was declared an Ecologically and Biologically Significant Area (EBSA), at Costa Rica’s request. The measure will boost conservation of and research on the area, which is a key migration and feeding zone for species like the blue whale (Balaenoptera musculus), the leatherback sea turtle (Dermochelys coriacea), and the short-beaked common dolphin (Delphinus delphis). “Making the ocean healthy guarantees an improvement in the living standards of the people who depend in one way or another on the country’s marine resources,” the deputy minister of water, oceans, coasts and wetlands, Fernando Mora, told Tierramérica shortly after the Dome was declared an EBSA at COP12. “It is one of the richest areas on the planet with a food chain that starts with krill (Euphausiacea), which attracts other species, including blue whales and dolphins,” Jorge Jiménez, the director general of the MarViva Foundation, told Tierramérica. “In that area is one of the greatest concentrations of dolphins in the American Pacific, that come from the west coast of California, to feed and breed,” he said. The Costa Rican Thermal Convection Dome is an area 300 to 500 km wide where ocean and wind currents bring the mineral- and nutrient-rich cold deeper water to the surface, creating the perfect ecosystem for a vast variety of marine life. 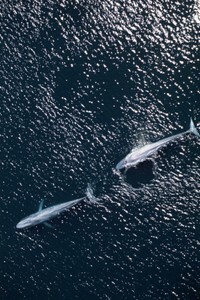 The nutrients give rise to a highly developed food chain, ranging from phytoplankton and zooplankton – the productive base of the marine food web – to mammals like dolphins and blue whales, which migrate from the waters off the coast of California. Because the dome is a mobile phenomenon caused by wind and sea currents, for half of the year it is just off Costa Rica’s Pacific coast (in the area of Papagayo, in the northwest of the country) and during the other half of the year it is blown further out to sea. The centre of the dome is 300 km from the coast of this Central American nation. In an initiative backed by MarViva and other organisations, the Costa Rican government decided that the “upwelling system of Papagayo and adjacent areas” will be an EBSA in the tropical eastern Pacific. Some civil society organisations have proposed regional initiatives involving the area, which they sometimes refer to as the Central American dome. But deputy minister Mora said the dome is a Costa Rican phenomenon. He pointed out that the scientific term for the area is the Costa Rican Thermal Convection Dome, the name it was given by U.S. physical oceanographer Klaus Wyrtki. In 1948 he began to study marine mammal sightings made from boats navigating from California to Panama. For the local authorities, conservation of the dome and the Papagayo upwelling system is among the priorities in the waters of the Pacific, because protecting the ecosystem brings economic benefits. Approval of the declaration of the dome as an EBSA by the 194 CBD signatory countries now makes protection of the area obligatory, said the deputy minister. In the case of exploitable species like tuna, the ministry of the environment and energy (MINAE) has drawn up a zoning decree that would make it possible to regulate tuna fishing in the dome. The tourism industry, a pillar of the Costa Rican economy, would also benefit from protection of the dome, because it is a migration route for blue and humpback whales, which draws whale watchers. In September, the sixth annual Festival of Whales and Dolphins, dedicated to whale watching in southeast Costa Rica, brought in 40,000 dollars the first day alone, according to deputy minister Mora, whose office forms part of the MINAE. Government officials, scientists and members of civil society hope this will make it possible to generate more information on one of the planet’s most biodiversity-rich marine areas. “From our scientific point of view, the first thing that should be done is to carry out research, and it is the last thing that is being done,” said Lizano, an oceanographer with the Marine Science and Limnology Research Center (CIMAR) of the University of Costa Rica. The area has been explored on several occasions. The last time was in January 2014, with the participation of MarViva and Mission Blue, an international organisation focused on the protection of the seas, which is one of the activist groups that pushed for special protection of the dome. 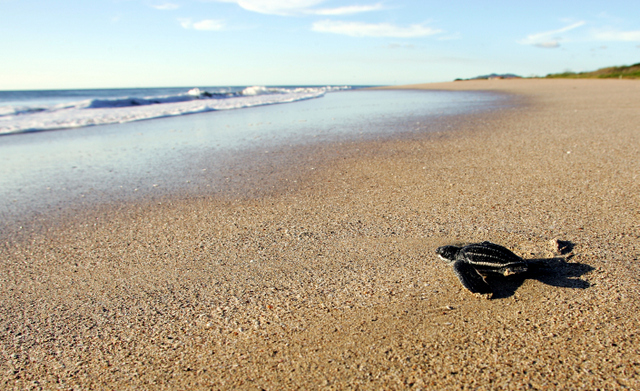 They studied the role played by the protection of the leatherback sea turtle out at sea. Although the dome is in Costa Rican territorial waters, the fact that it is mobile means it has an influence on the exclusive economic zones of other Central American countries, like Nicaragua and El Salvador, as well as on international waters. MarViva estimates that 70 percent of the dome is outside of the jurisdiction of any country, and the organisation’s director general, Jiménez, argues that what is needed is a joint effort and shared responsibility. Mission Blue and other organisations concur. “It is a regional matter, and all Central American countries should work together, because part of the dome is on the high seas, outside of their jurisdictions. This is like the Wild West. It’s disturbing because there are no controls or protection out there,” Kip Evans, Mission Blue’s director of expeditions and photography, told Tierramérica. But the government stressed that the nucleus of the dome is under its jurisdiction. “Historically it has been called the Costa Rican Dome and the nucleus is in Costa Rican waters. What we know as the Thermal Convection Dome is off the coast of the north of the country, not Central America,” Mora told Tierramérica. But the deputy minister and his team do agree with MarViva and other non-governmental organisations on the need for regional cooperation. Costa Rica forms part of the Organisation of Fisheries and Aquaculture for the Isthmus of Central America (OSPESCA), where it works together with bodies like the Permanent Commission for the South Pacific.